I have a secret passion for buttons. My mother's button tin was a source of stories and wonder when I was little. There were army buttons leftover from my Dad's uniform, beautiful crystal buttons from my grandmother's flapper dresses and big bold Bakelite buttons from Mum's old suits and edge to edge coats. It all seemed so glamorous and exotic,The button box itself was covered in faded, gilded images of the Taj Mahal. It made me yearn for travel and the grown up world. Well, now I have added to that collection and every new cardigan that I own has it's buttons replaced with something more interesting. My favourites are hand-crafted Dorset buttons from Alix at Big Blue Bed (BBB). 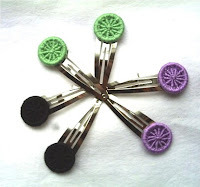 They're beautifully made, colourful and I even have a hair clip to match! If you visit her Etsy shop you're sure to find more delights and complete adventures for girls. I love to read historical novels, and read one once where the characters made buttons for extra money. The book listed the basics of how it was done, and talked about how intricate they were and how different areas of the country did them differently, and how each area thought theirs were the best! Thank you so much for this post and the link to Big Blue Bed. It is lovely to see actual hand crafted buttons. Thank you Su for the lovely feature. And Amy - I would love to know what that book was called.